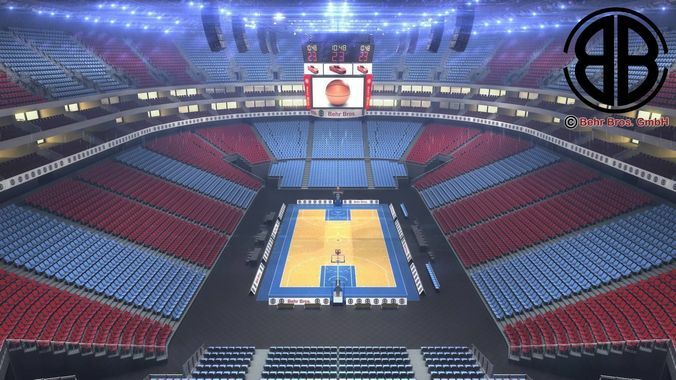 Basketball-arena with tribunes, seats, tables, detailed backstops, display, roof construction, advertisement-boards and ball. Textures for 3 different courts are included as tga, eps and Adobe Illustrator file. 3ds Max 2010 / 3ds Max 2013 Format: The resolution of the backstops can be changed as they have a meshsmooth modifier applied. 3ds Max 2010 version has standard 3ds Max materials applied. 3ds Max 2013 version has VRay materials applied. Maya 2010/ Maya 2013/ FBX/ Cinema 4D 9.6/ Lwo 6.0 / Obj/ 3ds Format: The model is included in one resolution including the high resolution version of the backstops. Previews rendered in 3ds Max using VRay. Light effects added as post effects.